After searching for years for socks that don't bind around the ankle I was excited to find these. I have purchased 18 pairs over the past year and wear them every day. Love them so much I threw out all my old socks. Highly recommend these. They have help up after multiple washes and leave no marks around the bottom of the leg after wearing all day. You really don't know you are wearing socks and they are super soft. I don't do many reviews but these deserve one. I prefer "Diabetic" socks because they are not tight when I feel swell up during the day. These are a good fit, soft and cozy. My left ankle is swollen due to edema and these socks do not bind nor constrict my foot. They do not cause my ankle to swell during the course of the day as other socks do. I highly recommend these socks. I'm not diabetic, but my ankles are thick, around 9 inches around with tape measure. It's kind of odd since I only have 6 inch wrists. It's nice to finally find socks that do not leave marks on my ankles because the elastic tops are too tight. 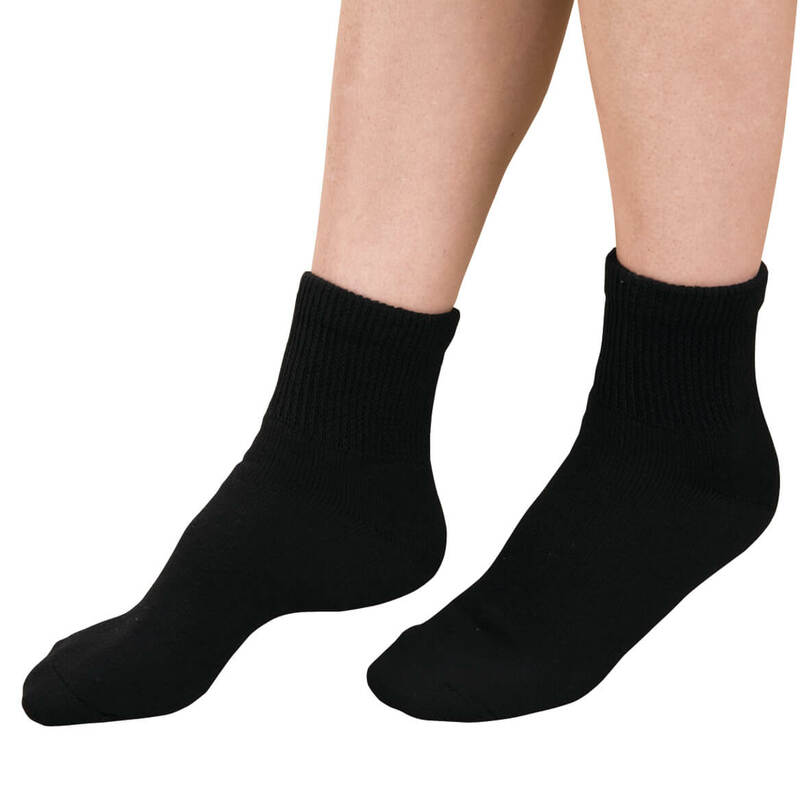 These socks also stay up and do not fall down the ankle. I love my socks! They are so soft, and comfortable. I love my socks. And I would recommend them to everyone. It is worth the price, and I can't find them in the store. So please keep making them. I love shopping with Walter Drake. I use this product every day and have several pair of the ankle style. I am an insulin dependent diabetic, and these socks are the best thing since sliced bread. They are comfortable with no binding around the feet or the ankles. Highly recommend this product to everyone. You don't have to be diabetic to love them! I'm not diabetic, but I hate tight socks. One day I got fed up and shopped for diabetic socks, and that's all I buy now. These are my favorite. I love the breathable weave and texture, but most of all the comfort. They stay up without pinching. I never put them one without thinking how much I like them. Great colors, too. I'm back to buy more! Will never buy any other socks. These are GREAT! I am not diabetic. I have peripheral neuropathy and these socks are the best I have found. Ordered three pair as my right foot swells with arthritis. Liked them so well I ordered another three pair. The only socks I have found that will still be comfortable even with a swollen foot. I really love these socks, they are non-binding and the foot part is padded so it cushions your foot but the ankle part is breathable and very comfortable. I originally bought a similar pair that Miles Kimball also sells, but they ran too small. So ordered these and they fit much better. 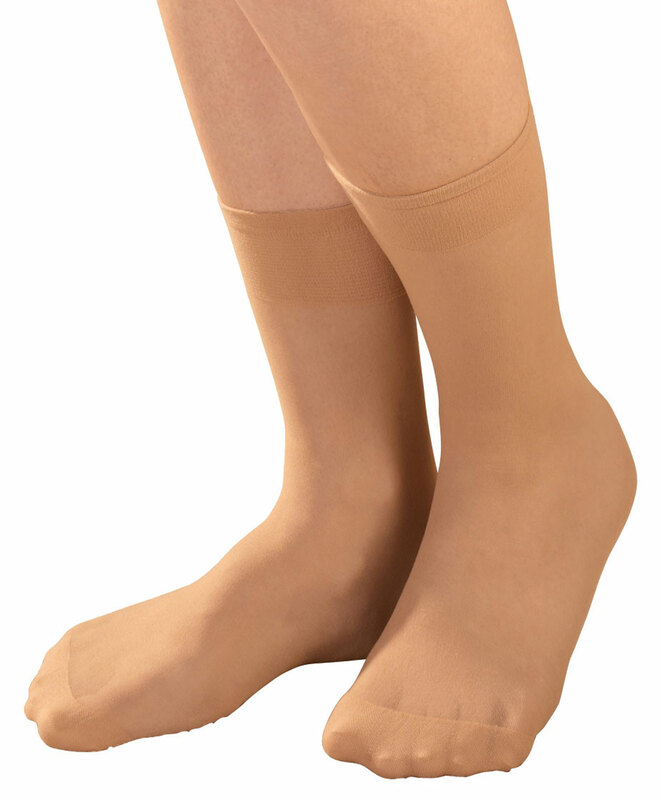 I have primary lymphedema and need socks that won't bind at the ankle. These are just perfect in that regard and they keep their shape till worn out. These don't pill as badly as more expensive socks I've owned and I'll continue to buy these as long as they're available. Only drawback I see is that they do seem to wear thin in the heel area a little sooner than I'd like. I had been given some diabetic socks before this purchase. These are just fine but not as soft a fabric or as stretchy at the top like the others. I don't know what brand or where the others were purchased. I would probably buy these again. These socks do not live up to their purpose. They are too short and ride down when they are worn. These three pairs of socks packaged together are not the same quality or features. The white pair is distinctively lower quality. The cuff is half the size of the other pairs and completely stretched before wearing. These are for me and are very comfortable especially under my boots when I need an extra layer. If you have diabetes these are great. When my legs swell they remain loose fitting and don't cut into skin. I would recommend them even if you don't have diabetes. 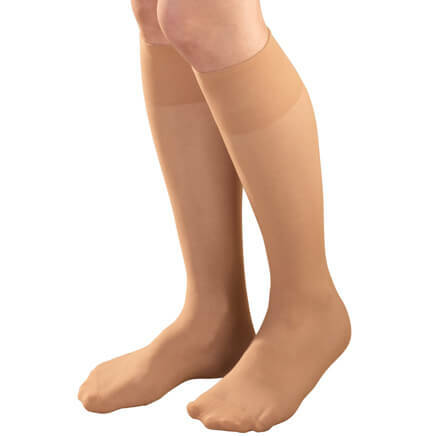 I have tried many different kinds of sock that are supposedly for diabetics, however, these ankle sock help prevent swelling up my leg, are easy to put on and are comfortable. I currently have these socks in other colors and like the fit. My husband has worn these before and loves them. I really liked the other diabetic socks I ordered from your company. I hope these are as good or the same brand that I purchased before. Expecting these to fit nicely for my wife who has "mild" diabetes. My husband has poor circulation in his legs and needs loose socks. I've purchased these in the past and like how they fit and wear. They don't pill like some more expensive socks. I have multiple pairs of black and white short-cuffed socks, but occasionally, I need beige socks. I bought this tri-colored pack primarily for its beige or *khaki* member. 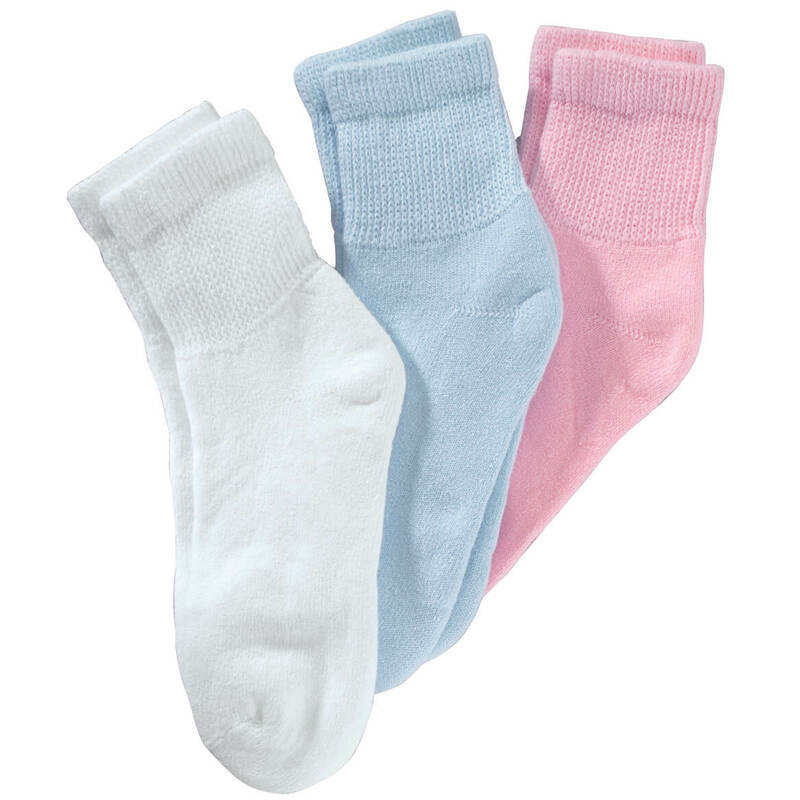 These socks too are extremely gentle on your feet. Have a girlfriend in Montana that is a brittle diabetic and does not take care of herself. As a nurse I thought this would be one way that I can help her out, even though she does not follow her diabetic diet. I am diabetic and these are very comfortable for my feet and ankles. Couldn't find anything comparable in local stores. I already have several pair and like them. My brother has smaller feet and is a diabetic. I ordered these because they come in a smaller size that will fit his foot. I wanted socks that would not be tight as I have circulation problems. Liked that you could get a pair of each color....white, black, khaki. I suffer from neuropathy and regular socks are to tight. 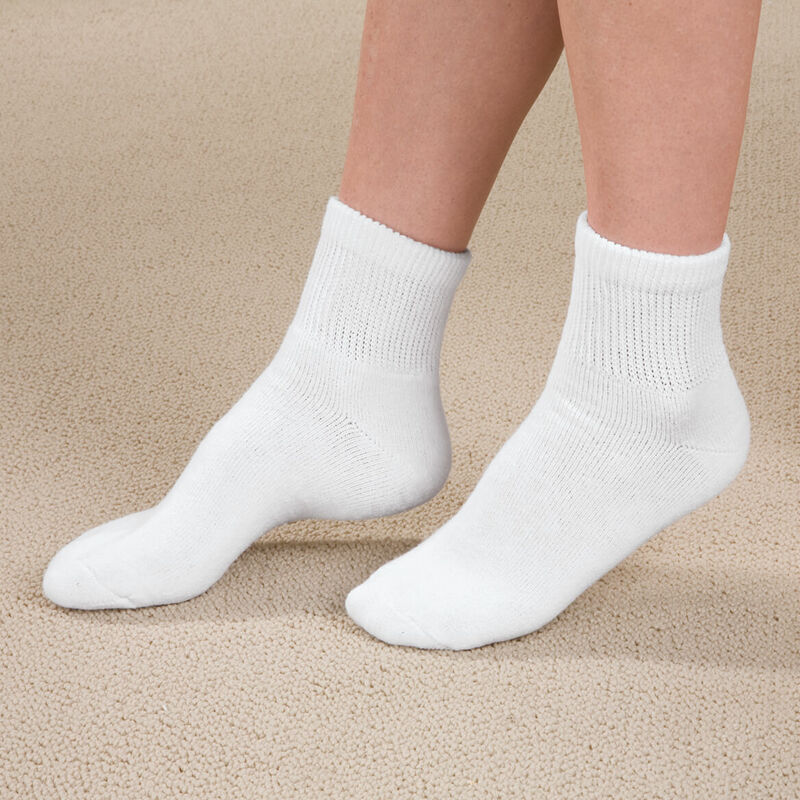 Your socks are more comfortable because they give you more room. I am diabetic and wear support wraps so I need something on my feet and ankles. Wraps only come to ankle. After I bought this item, my wife liked them, thus this order. I have used these socks for many years and have been very satisfied with them. 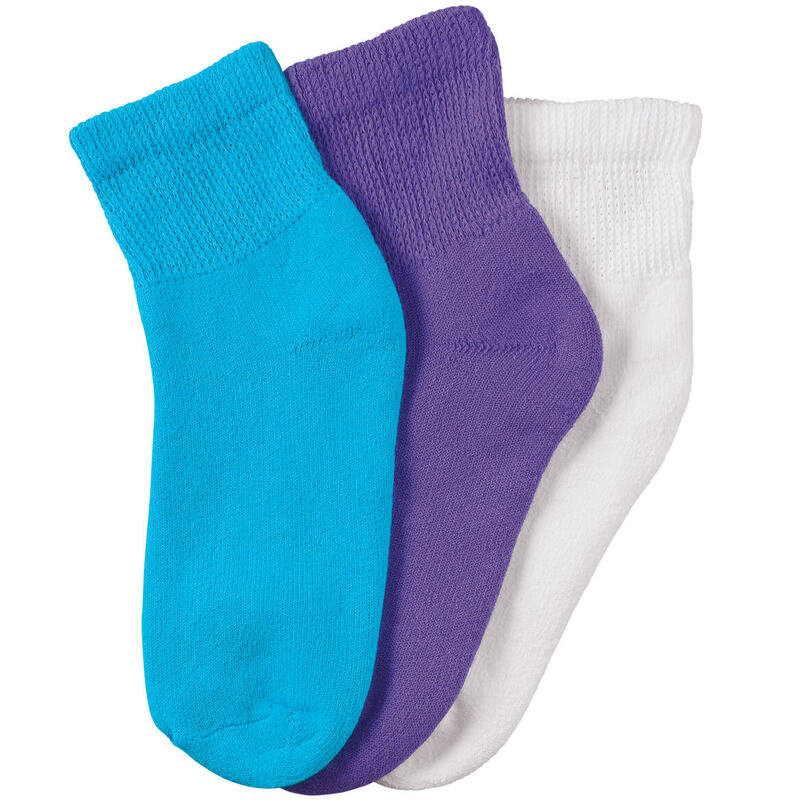 looking for the deep purple, turquoise, hot pink diabetic socks when will they be availbale? BEST ANSWER: Thank you for your question. Unfortunately the colors are no longer available in the large size. We could no longer get them from our vendor. We hope this information will be of help to you. Do those colors come in the Med. size? If so, when will they be available? Are these socks seamless across the top of the toes? BEST ANSWER: Thank you for your question. These socks are not seamless. We hope this information will be of help to you. Is there cushioning on the bottom? BEST ANSWER: Thank you for your question. The Diabetic socks do not come with cushions on the bottom. We hope this information will be of help to you. Can I get a package of kahki only? BEST ANSWER: Thank you for your question. Unfortunately no we only carry this in the three pack. We hope this information will be of help to you. You ALWAYS advertise the Turquoise/Purple/White which used to be hot pink, when are they going to be available? Every time I go to order them they are NEVER AVAILABLE!! BEST ANSWER: Thank you for your question. Unfortunately the Pink/Blue/White is no longer available in the Large size. We hope this information will be of help to you. I normally buy socks size 9 to 11. What size should I order? My shoe size is size 9. BEST ANSWER: Thank you for your question. 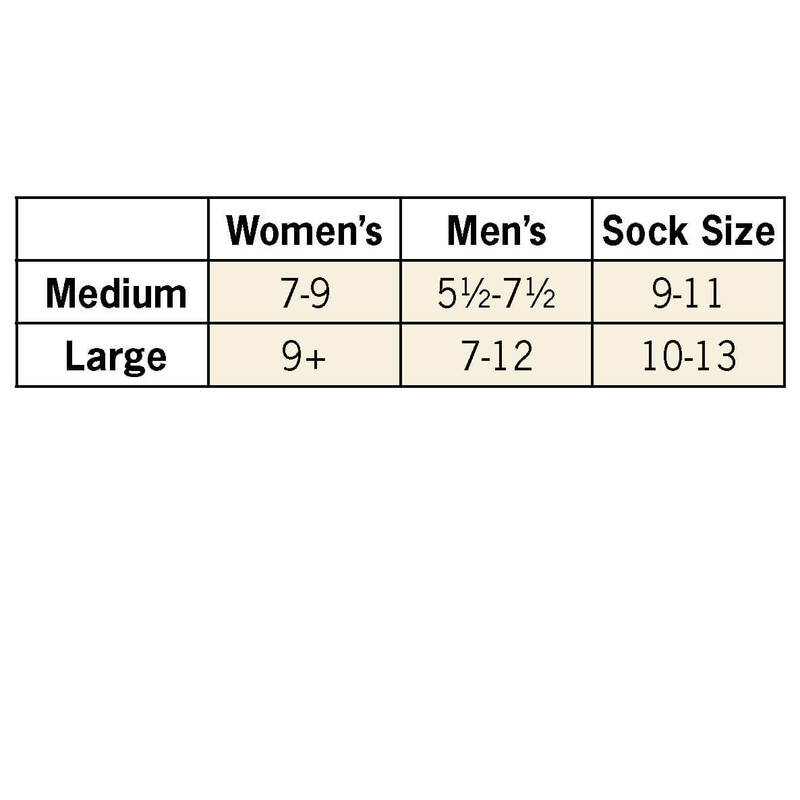 The sizing for the Diabetic Ankle Socks is a medium fits men's shoe sizes 5 1/2 - 7 1/2, women's shoe sizes 7-9. Large fits men's shoe sizes 7-12, women's shoe sizes 9+.We hope this information will be of help to you.